Sometimes a beauty look is the culmination of a single product. Case in point...this post. Enchanted by the creamy lapis blue that is the new Burberry Nail Polish in Imperial Blue, I felt inspired to embrace an eclectic approach that yielded two fish tails, a clean canvas, a subtle cat eye and a breezy pink pout. It's times like these that no rhyme or reason makes the most sense! Above: Products for my FOTD. Chanel Vitalumiere Powder Foundation in B30 (available in Europe and Asia only)...this whisper light formula offers incredible coverage and a natural, lasting finish that places it at the top of my current mineral powder favorites! By Terry Densiliss Concealer #3 Natural Beige (reviewed HERE)...banishes dark circles in 2 seconds flat...entirely worth it. Clé de Peau Beauté Radiant Powder Foundation in O 20 (also available at Clé de Peau Beaute and reviewed HERE)...I used this to touch up my nose and cheek area; the formula is incredible. Clé de Peau Beauté Luminizing Face Enhancer #12 (reviewed HERE)...soft golden beams of light in powder form, perfect for the high points of the face. Stilazzi and Cozzette Brushes (reviewed HERE and HERE)...beautiful synthetic bristles for adroit makeup application. La Prairie Cellular Radiance Cream Blush in Peach Glow (reviewed HERE)...I cannot get enough of this pigmented, luminous formula; just a touch tapped onto the apples of my cheeks is transformational. Beauty Is Life Shiny Eyeshadow in Handsome...I used this pale peach (with a slightly satin finish) to even my lids and add a touch of depth. Love this staple! Burberry Wet & Dry Glow Eyeshadow in Shell...I am totally smitten with this new formula, which features smooth color payoff and no creasing. Shell is a glowing warm beige with a blindingly beautiful luster. I added this over Handsome for a bit of shine. Comprehensive review of the new Burberry shadows forthcoming! By Terry Mascara Terrybly...lush, long, soft and flexible lashes in two coats. Surratt Beauty Autographique liner (reviewed HERE)...simply the best liquid liner on the market...used in this post to create a sleek cat eye that doesn't budge. By Terry Baume de Rose Gloss (reviewed HERE)...I now have two tubes of this wonder elixir in my possession and I hope I am never without it again in my life. As a balm, lip color base and shiny gloss, it is endlessly marvelous. Marc Jacobs P(Outliner) lip liner in Honeybun...this ultra smooth lipliner applies effortlessly, creating a stunning trail of opaque color; better yet, it lasts for hours on end. Honeybun is a charming peachy pink that is especially befitting for pinks and nudes. Topshop Charlie Ortise Oversized Flannel...a muted color palette, ultra soft weave and--gasp--pockets make this a wardrobe overachiever. Above: Products for an even and radiant complexion. 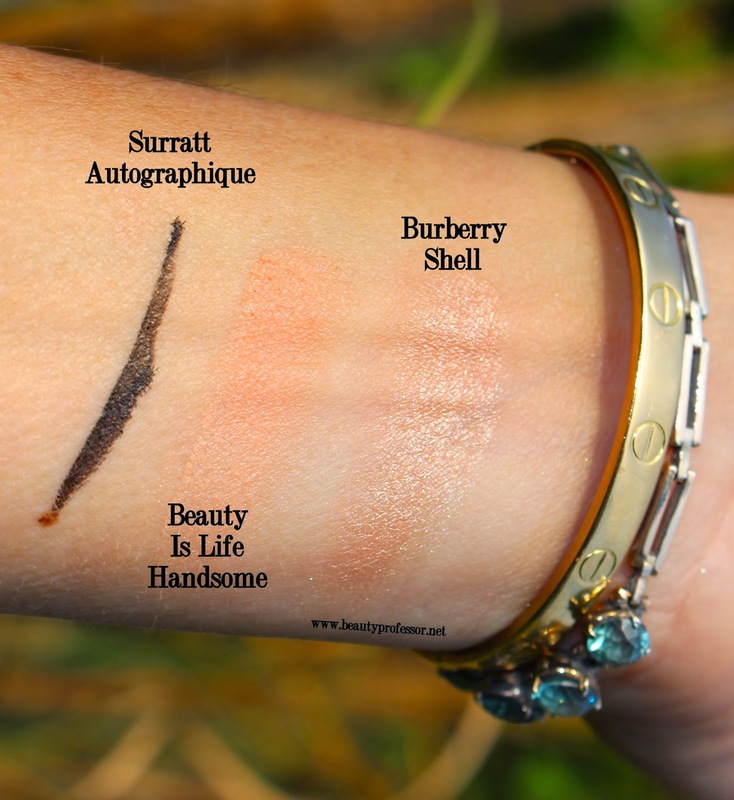 Above: Swatches of face products in direct sunlight. Above: The La Prairie Cellular Radiance Cream Blush in Peach Glow is breathtakingly easy to wear. Above: The polish that started it all...Burberry Imperial Blue. Above: Nail and eye products. Above: Burberry Wet & Dry Glow Eyeshadow in Shell...the luminosity is unreal! Above: Three products for a quintessential pink pout. 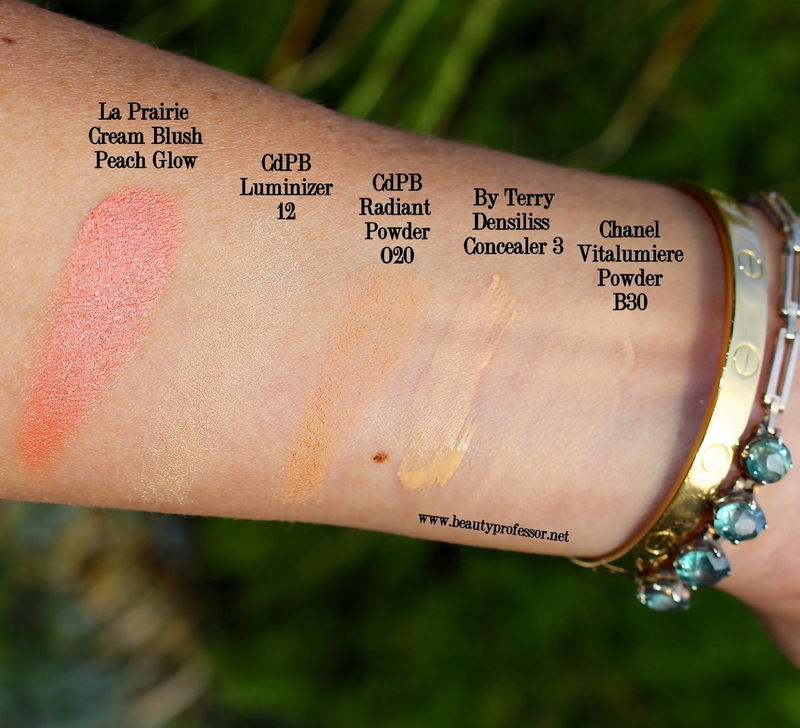 Above: Swatches of all lip products used in direct sunlight. Bottom Line: I hope you enjoyed this eclectic FOTD...I embrace a relatively restrained and natural look so often that sometimes it's amusing to change it up ; ) Although I use many of these splendid products on a regular basis, the new standouts for me, personally, include the La Prairie Cellular Radiance Cream Blush, Marc Jacobs (P)Outliner in Honeybun and Burberry Wet & Dry Glow Eyeshadow in Shell. All three perform so well and are delightful updates to one's spring makeup approach! I found the Chanel Vitalumiere Powder on eBay from a Canadian seller (that ships to the US). It took awhile to track down but shipping was quick! Adorable! The braids are just fantastic! Hope you have a lovely Sunday! Thank you, Sunny...so sweet of you! You look beautiful!! So fresh and lovely. Love your hair as well!! Do you have any suggestions for purchasing products that are only available in Asia and/or Europe?? Thanks!! Many thanks for the supportive words! With regards to your question, I suggest BoboDave for Asian products and eBay for anything you can't find on the BoboDave site. Harrod's and Selfridges online are fabulous for European products! Awww...you rock!!!! Love that nails and braided hair. Love it!!!! Hi Sue...thank you, my friend! How is life going? I just came back from a 2 weeks vacation and started to catch up with my beauty reads. I have much work to do! I cannot wait to watch your February favorites video. A mosquito bit my chin (my very first vacation day!) and now I have a huge purple mark on it. What will you recommend to erase it? My concealer gathers on it and looks gray and awful. I need this stain out of my face. So sorry to hear about your mosquito bite...I hope it has healed by now but in case it hasn't, I suggest neutralizing the dark spot with a bit of yellow or green corrector (Koh Gen Do and Physician's Formula both make great options) and then follow with concealer.